With a Rs. 10 crore-investment, Mahindra & Mahindra (M&M) has entered a market valued at Rs.15,000 crore annually. Mahindra & Mahindra (M&M), the Indian automotive major, announced Monday that it is foraying into the agricultural equipment rental services with the launch of its organised rental service TRRINGO. The initiative is primarily aimed at those farmers who are not able to afford their own tractor and farm equipment, the company said in a statement. M&M said the tractor and equipment rental market is currently valued at about Rs. 15,000 crore annually. According to Daily News and Analysis, the company plans to invest over Rs. 10 crore in TRRINGO. M&M said TRRINGO will be set up as a start-up company and it will operate as a franchise model. 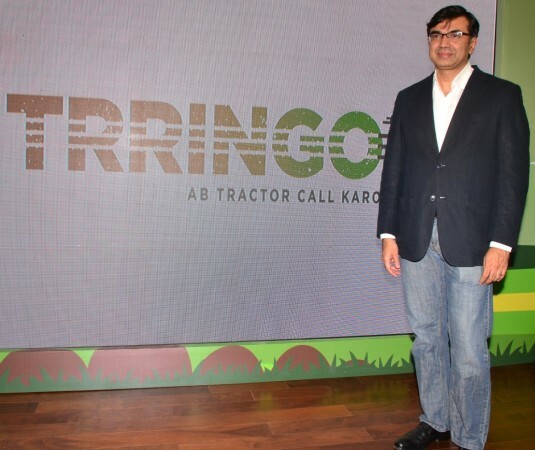 "TRRINGO will be an e-commerce start-up which will provide the brand promise of equipment availability, commitment and performance, to transform lives of farmers, enabling them to rise," Rajesh Jejurikar, president and chief executive for farm equipment and two-wheelers at Mahindra & Mahindra, said in the media release. M&M said this was a service primarily targeted at the farmers to bring in new-age digital technology to the tractor rental business. The company said TRRINGO is expected to improve the reach of farm mechanisation along with making farmers in India digitally empowered. "In our country where farm mechanisation penetration is low, Mahindra would like to play a significant role in enabling our farmers to improve their productivity and rise by providing accessible technology. This will increase their output and prosperity and lead to the inclusive growth of the nation," Pawan Goenka, executive director at Mahindra & Mahindra, said. According to Goenka, the TRRINGO farm equipment rental business model will enable farmers to deploy mechanisation technology on a pay-per-use basis without having to bear the cost involved in buying the asset. M&M said TRRINGO will operate on a dual business model. The first model is one where the franchisee will invest in tractors and equipment to rent them out and set up a hub for operations. TRRINGO will use a proprietary digital platform as an enabler to process orders and pass them on to the nearest franchisee through location-based mapping, the company said. The entire system is facilitated through a dedicated app and a toll-free number. The second model, M&M said, is a consumer to consumer (C2C) model. In this model, large farmers owning high-end equipment can rent out their assets so as to optimise utilisation based on seasonality and across geographies. Mahindra & Mahindra said TRRINGO would connect the asset owner to the user through the app. This model is primarily aimed at improving mechanisation in the Indian agricultural sector by enabling smaller farmers to access technology that can boost their yields and overall farm prosperity. The company said it will begin operations in June this year and plans to scale up to five states by August this year.